Did i mention i love muscle cars? If you think i haven't, you 're definitely new here. Love em so much that i actually bought a tamed modern 4 door version of one of the most iconic muscle cars ever (more on that in a later post). I had the chance of looking at (ogling would be more accurate) some incredible muscle cars at a recent car club gathering, where i came across this orgasmic beast - the '68 Chevy Camaro SS 327. Save a few minor details here and there, the car was in immaculate state, like it could have rolled out of a production line. Someone really did take good care of this one. 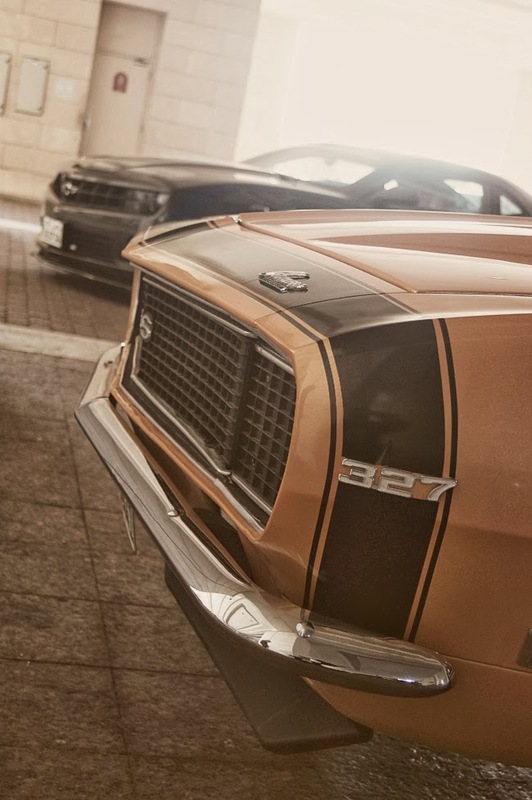 If i had a time machine, i'd go back to 1972, where the streets would be filled with all the chargers, challengers, cudas and camaros (whats with all the C's?) that came out between '68 and '71. Or maybe i already did go back and this picture was from back then. I didn't just go back, i went back in style - in a 2010 Hennessey LE Camaro RS (the black beauty in the picture). Good times Y'all.